The E560 is a triple-mode effects module: a thru-zero frequency shifter, a phaser, and a ring modulator. 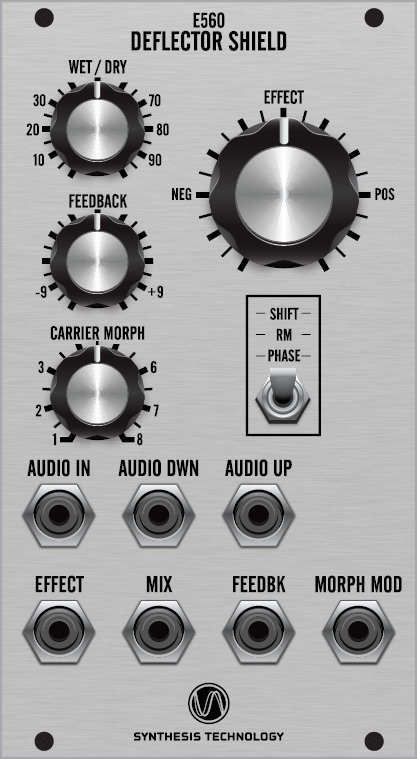 What sets the E560 apart from other DSP effect modules is the unique carrier wave morphing feature. Traditional frequency shifters and phasers use sine waves as the carrier/modulator, but the E560 has eight different carrier waves that can be continuously cross-faded to create never-before heard soundscapes. The eight carrier waves are specifically selected to give the widest sonic palette, from simple frequency shifts, to 64-note "pattern sequences," to extreme harmonic content. There are three operating modes available: Shift, RM, and Phase. SHIFT is a frequency shifter that can shift thru-zero with two simultaneous outputs (down and up). Like traditional frequency shifters, a sine carrier will generate a smooth shift but the E560's seven other waves will generate a vast array of harmonic content and even patterns of evolving timbral shift. RM is a standard ring modulator (4-quadrant multiplying VCA) with a twist: the two outputs are always forced into quadrature (90 degree phase shift). The eight carriers can produce everything from tremolo effects to gating to high degrees of distortion. PHASE is an E560 exclusive mode. The audio input is applied to an eight-stage all-pass network. The two audio outputs are in quadrature, but in turn phase shifted from 0 to 360 degrees relative to the input. Not only that, the "vector" the phase shift follows is the data in the carrier wavetable. The phase shifting can be linear (saw wave), traditional (triangle), or bouncing all over the place (64-random phase waveform). Not only do you have full control over the chosen effect, but also the Wet/Dry mix, and applying either positive or phase-inverted (negative) feedback, this introduces peaking at certain harmonics or cancellation of those harmonics. Applying a slow LFO to the feedback CV can produce a wide range of constantly changing spectral content. There are four CVs available to control the E560 in real-time. All four of the panel controls have a corresponding CV input, so that you can "turn" all 4 knobs at once by applying 4 CVs. The E560 is another unique DSP-based module that has no equal in the modular world, in any format. If you're stuck in a musical rut and looking for a new module with a wide range of sounds, the E560 might be exactly what you're looking for. Jumper Options JP2: enable/disable carrier wave output at Audio Down/Up jacks when Mode switch is set to Phase. Due to AC coupling in the audio DAC filters, this waveform will only be full-scale at frequencies above 5Hz. Feedback Apply negative feedback (CCW) or positive feedback (CW). When placed in the center, there is zero feedback. Carrier Morph There are 8 waveforms for the internal carrier oscillator (sine, triangle, saw, square, 16-point random phase, 64-point random phase, spindle wave, and 3x frequency sine). This control smoothly cross-fades from one to another as you turn it. If you are in doubt on which one to use, start with the sine wave. FREQ mode: the knob is bipolar, meaning when ‘straight up' in the center, no frequency shift is applied. As the knob is turned CCW, the shift goes down and CW, the shift goes up. RM mode: the knob applies the carrier selected to a 4-quadrant multiplier (‘ring mod'), and EFFECT is the frequency of the carrier. PHASE mode: the internal carrier is disabled. The knob sets the phase shift from 0 degrees (full CCW) to 360 degrees (fully CW).